Home » Culture » Will Radical Liberals Control The Supreme Court? Will Radical Liberals Control The Supreme Court? The importance of the US Supreme Court has been made manifestly clear in numerous decisions, not the least of which was the tragic and illegitimate ruling to redefine marriage with no constitutional basis whatsoever. NOM is committed to doing everything in our power to reverse that injustice, and that is why we have been so focused on electing a president who is a champion for marriage, like Sen. Ted Cruz, who can nominate constitutionalists to the Supreme Court who will reverse the anti-constitutional marriage ruling. The untimely passing of Justice Antonin Scalia this past weekend has thrust the makeup of the Court full square into the forefront of the presidential election. If Barack Obama gets his way — which, thanks to a conservative US Senate that you and I helped elect, he won't — he would appoint another radical who will push the country further to the left. Every issue that is the subject of debate in the country could be affected by the next Supreme Court appointment — reasonable restrictions on abortion, the restoration of marriage, the right to bear arms, immigration, terrorism, national security, privacy, etc. The stakes could not be higher. Please stand with us in fighting for a president we can count on to appoint only justices who will uphold the original meaning of the constitution and reject the dangerous and illegitimate notion that the constitution means whatever five unelected lawyers say it means. Your contribution of $15, $25, $50, $100, $500 or even $1,000 or more will be put to immediate use helping us fight for marriage including supporting a candidate like Ted Cruz who is committed to restoring marriage to our nation's laws. Right this moment we've got a powerful new television commercial being aired in South Carolina that will help voters understand that Donald Trump definitely is not the kind of champion we need. Trump was the first to quit on marriage in response to the illegitimate ruling of the Supreme Court, saying "we have to go with it, the decision's been made and it's the law of the land." But we don't have to "go with it," and we don't have to go with Trump. 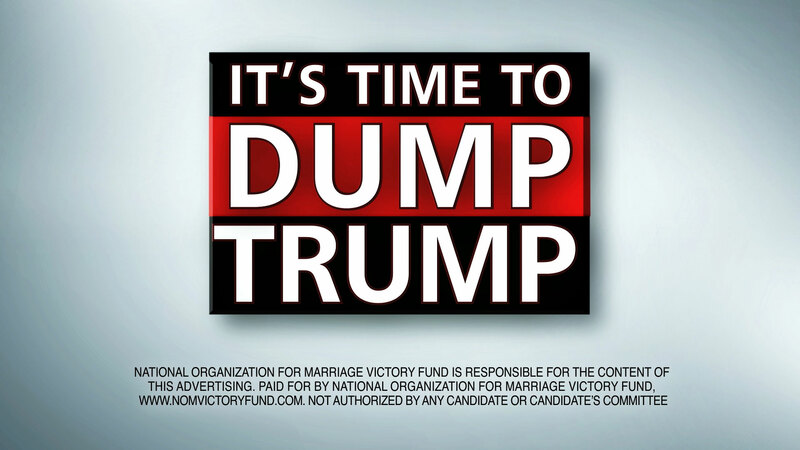 In fact, our advertisement urges voters to "Dump Trump." The replacement of Justice Scalia is not likely going to be the only appointment the next president makes to the Court. Ruth Bader Ginsburg turns 83 next month. Anthony Kennedy will be 80 in July. And Stephen Breyer turns 78 in August. The marriage decision came on a 5-4 ruling. Justice Kennedy went with the liberals to redefine marriage. In order for this ruling to be reversed, we need a justice to replace Justice Scalia who shares his view that the federal constitution does not contain a right to gay 'marriage.' And then we need the next appointee to also subscribe to an "originalism" adherence to the constitution. Making appointments to the Supreme Court, while critical, is certainly not the only way in which a president can fight to restore marriage to our nation's laws. Ted Cruz has already called for a constitutional amendment to make clear that states have the right to define marriage as one man and one woman. As president, he will have a powerful megaphone to advance this proposal. Donald Trump does not support it. The next president can demand that Congress pass legislation such as the First Amendment Defense Act to protect supporters of traditional marriage from governmental discrimination and punishment simply for continuing to stand for marriage in their daily lives and at work. Ted Cruz is a co-sponsor of this legislation. Donald Trump has been silent. The next president can reverse the Obama Administration's unceasing attempt to push the gay agenda on countries throughout the world, including by tying foreign aid to acceptance of gay 'marriage' and other pro-gay policies. Donald Trump cannot be trusted to do this. On front after front, the next president will be critical in determining if the fight to restore marriage takes several years, or several decades. That is why it is imperative that NOM have the resources we need to educate the public about the candidates' positions and to advocate for the election of a marriage champion like Ted Cruz. Your contribution to the NOM Victory Fund in the amount of $500, $250, $100, $75, $50 or $25 — whatever amount that is right for you — will go to ensure that we are effective advocates for the truth of marriage as the union of one man and one woman. South Carolina voters go to the polls in just three days so it is critical that I hear from you immediately. If you have already contributed to help us air our "Dump Trump" TV commercial, thank you! But if you have not yet been able to make a contribution to this critical undertaking, please do so immediately. I know I can count on you to make marriage an important issue in the South Carolina primary, and in many states to come. Thank you for all that you've done in the fight for marriage. PS — When Donald Trump quit on marriage in response to the Supreme Court ruling, he quit on you and me. We have a great opportunity to disrupt the Trump campaign in South Carolina if we can secure funding for our "Dump Trump" TV spot. Please give generously today.